If you're unfamiliar, the Enneagram is a personality test of sorts, but it's so much deeper than that. It has been a vital tool in understanding myself, my husband, and my children better. It has helped me heal some serious wounds from being misunderstood. And it has really helped me feel more alive and confident in who I am! The Enneagram will guide you through transformation and growth as you walk through a simple three step process of discover, explore, and become to your truest self. 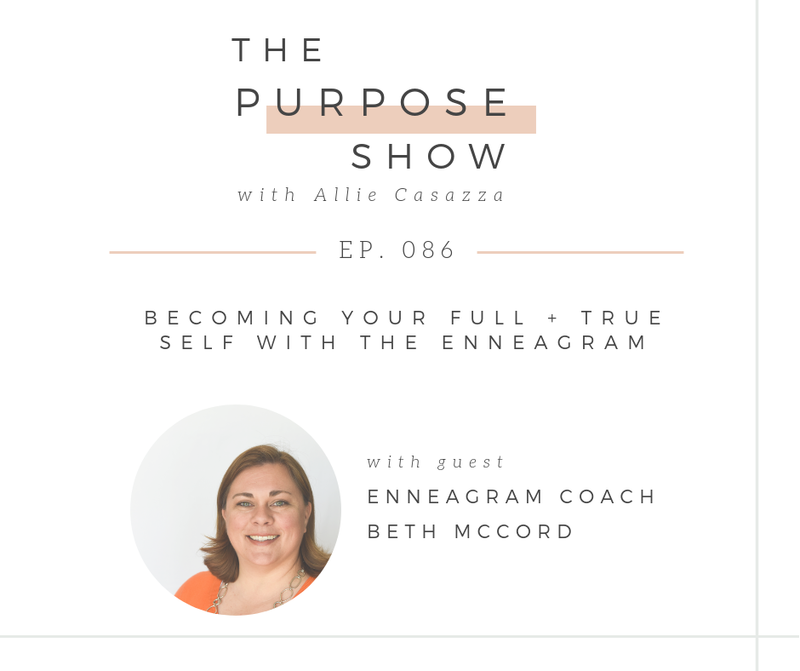 Beth McCord is a wealth of wisdom on this topic and I am so excited for you to hear from her perspective in this episode! What the Enneagram is and how it is different from other personality tests. Why the Enneagram matters and the value it places on truly discovering who you are. How the Enneagram will help you better understand those around you. A brief description of each Enneagram number. Hey, beautiful friend! Oh my gosh, I am so looking forward to sharing today's episode with you! I am talking with Beth McCord today. Beth McCord is Your Enneagram Coach on Instagram. She's got a really great following. She's so active on that platform and she shares so much wisdom. So, before we even dive into this today, if you're not already following Beth on Instagram, head to the show notes and get that link or search for her on the Instagram App. It's so worth following, very insightful. If you're unfamiliar, the Enneagram is a personality test of sorts, but it's so much deeper than that. This has really transformed my life in the way that I understand myself, my husband and even my children as they're starting to get a little older and I can see more of who they are. I could just go on and on, but I don't want to do that in this intro. I just want to dive into the episode because Beth gets into so much of the details. This is such a great episode. I really encourage you to continue listening even if you kind of feel like, well, I don't really know what this is or I don't really know how it will help me. It will. It's amazing and it's going to be followed by a second part episode that'll be coming soon that’s focused more on the Enneagram and marriage. This is really a great tool to get to know yourself better and to understand yourself more fully. The Enneagram has helped me heal some serious wounds just from being a person and being misunderstood. It's just been really great to know myself and who I am in Christ more fully. This is an excellent episode that kind of dives into what the Enneagram is. Beth is just a wealth of wisdom and we're going to dive into the conversation with her now. BETH: Hey, thanks for having me. I'm really excited to be here! ALLIE: Me too. Okay, so why don't we start by just having you introduce yourself to everybody listening. BETH: Yeah, so I'm Beth McCord. I live in or just outside of Nashville, Tennessee and I am an Enneagram coach. I started yourenneagramcoach.com. I get the privilege of watching people's lives transform and grow right before my eyes by taking them through a simple three step process of discover, explore, and become your truest self. ALLIE: Yeah, I love that. That was well put, very to the point. I just want to jump right in because I think this is going to be a really meaty episode. I’ll prompt you for a couple of questions, but I really just want you to feel free to talk and just take over this episode. Why don't you tell us what is the Enneagram and how is it different from other personality tests? Why does it matter? All of that good stuff. BETH: Well, so the weird word, Enneagram is a Greek word where “ennea” means nine and “gram” means diagram or drawing of some sort. And so, for the listeners out there, they may not realize this, but there's a nine-pointed geometric figure, or a nine-pointed star, inside a circle. And that symbol has great meaning and implications of why we do what we do, which is what the Enneagram is all about. A lot of typologies out there, which are great, are really talking about your preferences, behaviors and things that are happening outside of yourself. And this typology is speaking to “why” you think, feel and behave in particular ways. The way I like to describe the Enneagram is that it is an internal GPS, where it is helping you to not only know why you do what you do, but to also help you to steer yourself back into your right path for your personality type. When do you veer off course? A lot of us will be going around, you know, like driving on a highway and the GPS knows your current location, right? Which is your main Enneagram type. And then we have a destination that we're aiming for, which for us would be the healthiest version of our Enneagram type. Through Enneagram books and other resources, we can know what that looks like for your type. And so, we're trying to obviously stay on that path, right? Well, we fall asleep, we're texting, we're distracted, whatever it is, and we veer off course, and we often land in common pitfalls time and time again. And we get stuck. We're confused. We're irritated with ourselves or we put ourselves down. You name it. Because it's like, “Why am I doing this? Why am I stuck? This isn't working. Well, we don't know why we're doing it because it's just happening to us. So, the Enneagram is gonna help you to know why you do what you do, but it's also going to let you know before you veer off course that you're veering off course. We call that the rumble strip on the highway. So just like all of us are driving along and we get distracted or whatever's happening, we hit that rumble strip, you better wake up and get aware of yourself so that you can stay on your best path. Because if you don't, you are going to veer off course. And what happens is (whereas hopefully this doesn't happen to your listeners when they're driving) that when we hit the rumble strip when we're really driving, we do get back on path. But what happens in the internal world is we've been so used to our personality telling us to veer off course. Like thinking, “Oh this is going to help.” It's like muscle memory. We hit the rumble strip and we’re like, Oh!” And then we just veer off course and we’re like, “What? This did not help.” But we don't know any other way of doing it because we've done it that way our whole life. The Enneagram is going to show you how to stop veering off course. It's going to take a lot of time, a lot of effort, a lot of work, super hard. But man, is it so much better than being in those pitfalls. It's so much better than being in our own quicksand or pits. So, the Enneagram is going to help us to understand that and hopefully, if we have other people in our life that are doing it with us and encouraging us, man, it's so much easier. So that is kind of the first understanding of the Enneagram, is it being your internal GPS. ALLIE: Okay. I love that analogy. Can you give maybe a little bit of an example, either from yourself or from someone you've worked with, of what that exactly would look like? Because I think it's a great analogy, it's super clear and it helps us understand like, “Okay, I get why this isn't really a personality test exactly. It’s way more than that.” But can you maybe give an example of what that would look like with the getting off track and coming back for a specific personality type that you've worked with? BETH: Absolutely. Yeah. So as a coach, one of the things that I'm trying to help people to do is become A.W.A.R.E, and that's an acronym. I use the acronym to also help illustrate this with a personal story. So, the acronym A.W.A.R.E is the first A, which is “awaken” - to awaken to ourselves that we actually do things that aren't always helpful, but also what do we do that is amazing and wonderful. So, the “awaken” is a really important step. Anytime I'm putting myself down or accusing myself, that only sends me even further in a bad place. Whereas if I can welcome it, I can then more honestly open it and give it back to the Lord in a way that my hands are open versus this closed, clenched fist. The A is “ask” and we want to ask the Holy Spirit for clarity and understanding of why this is happening, what is going on internally for us. We want to ask the Holy Spirit to give us that clarification, wisdom and how to navigate our heart. And the R is to “receive.” Receive the knowledge, insight, and the blessings of who we are in Christ. It's already ours. A lot of us are trying, straining, striving, working so hard to get in the room we're already in. So I'm in my office right now and if I was like, “Oh, Allie, if I could just be in my office,” and you’d look at me like, “Uh, you’re already there.” Right? That's kind of what we're doing with Christ, and forgiveness. You already are His beloved child. Stop striving in the way that your personality is trying to convince you that you must do and simply just rest in the arms of Christ that you're already there. That's the receiving. Then the E is “express.” Express who you are through the gifts and the qualities that God has designed you to be. Meaning, as a type 9 for myself, how has God designed me to be the healthiest version of myself that reflects Him and His glory and bless others, and also I get to enjoy. We went to express that. So an example of using this kind of analogy and the Enneagram as an internal GPS, here's a great one. About a year ago, we were heading off to Philadelphia for a work presentation that I was going to do, my husband, my daughter and I, and we had to get on the road, let's say about 8:00ish. I woke up 15 minutes later than I planned. So we were 15 minutes behind schedule, which isn't the worst thing, but when you're living in Franklin and you have to get all the way up to Nashville in rush hour, not the best plan, right? Well as a 9, when people understand the Enneagram, what they're going to see is that there are lines that are connected to each type. There's two lines. My two lines are connected to type 6 and type 3. And as I teach them in my course, Discovering You, it's the basic foundational aspect, Cliff Notes version of the Enneagram, what they'll learn is when each type is struggling and under stress, they're going to take on some of the attributes of another type. So for me, I don't become a 6 but I take on some of the attributes of a 6. So all of a sudden this peaceable type 9 who can be easy going, all of a sudden became irritable, defensive, testy, anxious, worried. All these things that are not fun for anyone to be around, but my family was getting the blunt end of it because I was running late. And so I was mad at every red light, every traffic stop, every school intersection, you name it. I realized in that moment I hit the rumble strip inside and I was like, “Oh, I totally know what's going on. I am anxious because what if we’re late? And this is a job thing and I need to get there. ALLIE: It’s not an excuse to just do whatever. But it helps you understand that I'm reacting like this and I can control a lot of it, but I'm not going to be super peppy until this is over. BETH: Exactly. Yeah. And they could support me too. Sometimes my family has seen me all anxious and worried where I haven't hit the rumble strip or I'm hitting it, but I'm not paying attention, and they can see I'm worried and anxious about something else. And they can say, you know, obviously if they're doing well, “Hey mom, I can see you're really anxious and all worked up. Are you okay? Or is there something I can do?” Instead of them being like, “Oh, why are you this way?” That's not going to be helpful to me. But if they can have compassion and understanding for why I'm doing what I'm doing, all of a sudden they can move into my world with compassion and love in a totally different trajectory that can snap me out of it and make me feel like, “Oh, thank you so much. You totally saw what I needed and I really appreciate that.” Or just having the love, compassion and mercy is so important. So also each type, the path of growing, like when I step out and do my own business as a type 9, which is really hard for a type 9, my family can go, “I'm so proud of you. I know this is really hard, but we're seeing you take action and doing it.” Whereas maybe another type they build businesses in their sleep. Not that it's ever easy, but it's not at the same level. But for that type, maybe doing something that I do is easy for me, is super hard for them. So that's in a nutshell how you can kind of see how the Enneagram can be really powerful. BETH: Like for instance, if you and I were to become friends, (I’m a type 9; you’re a type 8) 8’s are perfectly fine with confrontation, in fact they call it “confrontational intimacy” while the 9 is running far from confrontation of any kind. Even just a little tension or debate is super uncomfortable for us. But now that I understand the heart of an 8, I'm like, oh, okay, cool, I can totally go there. Not like I want them to be at conflict with me, but a lot of times what I'm seeing is, “Oh! I see behind this tough facade or this intensity and I see this really tender heart.” I know we’ll get to this at the back end of the show, but I see the heart of an 8 now and so it allows my 9-ness to go there and not take it so personal or like this big personal attack like, “Oh, okay. Yeah. So she's just enjoying this conversation and it's not what my personality says it is.” That allows us to have a whole different relationship than a reactionary relationship. ALLIE: Yeah. That's incredibly powerful. I love that. So, before we get into maybe a little bit more personal stuff, can you go over the types and just as briefly as you feel is good to give a brief explanation of each one? BETH: Absolutely. I'd love to. We've talked about this before, so I'm just going to give your audience kind of a heads up. I’m going to literally just kind of go through it pretty quickly without us having a lot of chit chat or back and forth because going through all 9 types, it’s really important to hear everything and it can be really challenging for people to find their main type, so we just want to give a due diligence to each. In finding your main type, a lot of people want to go take tests (and I have a free one on my website and some of them can be very helpful) but tests are only about 75-85% accurate. And the reason why is that the Enneagram is trying to help you to name your internal world. Well that's really hard if you don't know your internal world, right? So a lot of times we can get mistyped through the test. What I recommend is that you listen to what I'm going to say here, but also under my free test is this pdf that I'm actually going to go through right now and you can download it for free. It's Step 2 under the yellow button “take a free assessment” so people can go ahead and access it. Use it as a fun party conversation starter as well. When you're trying to find your main type, there are core motivations - remember we talked about why we do what we do. There's four things that I really want people to look at. You have a core fear that you're always running away from. You have a core desire of the thing, “Oh, if I just had this life would be amazing or perfect.” And then we have a core weakness, an Achilles heel, the thorn in your side, that keeps tripping you up all the time and you're so frustrated with it, but it won't go away. But God's strength and grace is made perfect in these weaknesses. And then we have a core longing. This core longing is what our heart has always longed to hear and still longs to hear. Those are the things you want to listen to. A lot of people are like, well, can I have a core fear over here and a desire over there? You're wanting to find the type that has all of these the strongest. Okay? Type 1 is the “moral perfectionist” and their core fear is being wrong, bad, evil, inappropriate, incorruptible. So what they're desiring is to have integrity, to be right, to be virtuous, to basically be the good boy or the good girl. It’s all about ethics and morals. Their core weakness is resentment. And this resentment is really anger that's been repressed. A lot of ones will say, “What? I’m not angry.” But the resentment kind of comes up into being critical, judgmental, nitpicky. Why the resentment is there is because for them they have a loud inner critic that is constantly berating them and telling them what's right and wrong. Because when they walk around, the inner critic sees the missing things with the errors of the world, the imperfections, and it leaps out at the one and it assaults them. And they think this happens for everyone else too. So if there is something on the carpet that shouldn't be there, they think everyone else sees it too, just like they see it. And then when others don't, then they get hurt and frustrated like, well “Sue didn't pick that up. How could she have missed it? She must be leaving it just for me?” Then the resentment comes up, so it makes sense. But the message the 1 longs to hear is you are good. That would be so amazing for them. And so, what I teach as I coach people is how the Gospel answers all of their core longings. We don't have time to go through it now so people will have to hang on and go through that another time, but the core longing is always answered by Christ. So the 1’s are wanting to know that they are good. The type 2 is the “supportive advisor.” They fear being worthless, needy, dispensable, inconsequential, and unworthy of being loved. What they really long for is to be appreciated, loved, and wanted. Now their core weakness is pride. The pride of the 2 is first the inability and unwillingness to acknowledge their own suffering, emotions and needs, and so what they do is instead they focus on others' needs and emotions, so when a 2 walks into a room, they're feeling other people's feelings and they have this intuition of what they need. They move into that person's life so they assert themselves and insert themselves in a way that is helpful for that person. Whether the person has asked for it or not, wants it or not, the 2 is going to insert themselves because their core longing is that they want to be told they are wanted and loved for being who they are. And they think that they'll only get that if they serve and help in some form or manner. So the 2’s pride blinds them to their own needs and make them focus on others only. Now the difference between the 2 and the 9, we'll get to the 9 a little bit, is that again, the 2’s are always feeling that they need to insert themselves into people's lives. The 9’s are much more accommodating when asked and more withdrawn, not inserting themselves. The type 3’s are the “successful achiever” and they fear failing, being incompetent, inefficient, exposed, worthless, or unable to appear successful. The core desire is that they want to be valuable, admired, have high status in regard, to be well respected by others. So, for them it's all about image. Are people seeing me as successful and admirable. Their core weakness is deceit. Deceit for them means that they are deceiving themselves into believing that they are only the image they present to others through their success and achievements. So I tell people, this is kind of like my husband was a place kicker in college, and with place kickers, there's a saying, “you're only as good as your last kick.” If you missed, you’re horrible; if you made it, you're amazing. That's how a 3 feels about achievements and their image. If I was successful, I must be amazing. If I was anything less than 100% amazing, I'm the worst. They're always striving to be successful so that they will feel loved. What they really long for though is to be told that you are loved for being just who you are. You don't have to achieve or do all these accolades. You are loved for simply being you. Now, the type 4 is the “romantic individualist” and they fear being inadequate, emotionally cut off, plain, mundane, defective, flawed, and without having a certain significance, an authentic significance in the world. They desire to be unique, special, and true to themselves. So knowing their authentic self, that's their big core desire. Now where you are going to understand them a little bit better is their core weakness. And this is envy. Now, envy is the feeling that something fundamentally is missing in the, but they look around and they feel like others possess these qualities that they lack. They long for what they're missing and they feel like they have to get it in order to be loved. So think of the 4 as being like we're all puzzles and it's like we're putting this puzzle together and at the very end there's that missing piece and you're like, oh man would've been so great. It was going to be a beautiful puzzle, but now it's defective. That’s how the 4 feels about themselves inside. So in order to be loved, they have to present a unique, significant image of themselves so that the world will look past this flaw and see something worthy of being loved. Type 5’s are the “investigative thinker.” They fear annihilation, being ignorant, invaded, incapable, not existing. They're afraid of having obligations placed on them and intruded on. Their desire is to be capable and competent. Where you're going to understand the 5 the best is through their core weakness, which is avarice. Avarice here in the Enneagram means that they feel that they lack inner resources and that too much interaction with others will lead to catastrophic depletion. This leads them to withhold themselves from contact with others. Thus they hold onto their resources and minimize their needs. So think about the 4’s as this internal battery like on our phone. They only have, let's say 20% for the whole day. And let's say those extroverts out there have a Mophie Case on and they go be with people and the people hit that Mophie Case button, then it's like they're good to go forever. Introverts might only last maybe 75% of the day. So 5’s recharge by being alone, having time to think through their thoughts and feelings and process them. When they're with people that get drained really quickly and that is the core thing for the 5. They also love to have knowledge to make them feel secure and competent. Now they long for someone to say, “Your needs are not a problem.” They feel like giving anyone any of their needs is going to overburden them, so they try to minimize their needs and do it in their own way. Now the type 6 is the “loyal guardian” and they fear fear itself, being without support, guidance and security, being alone, blamed, targeted and physically abandoned. What they desire is security, guidance, and support. Now the 6’s is are the most complicated on the Enneagram because they're the most contradictory in and of themselves. They can be strong and weak. They can be courageous and fearful. They can be extroverted and introverted. They can be pretty much anything that has two sides to a coin. And so a lot of times what you'll hear is 6’s will go, “well, it depends” when they're trying to find their type and it depends on the circumstances. So for the 6’s that are out there, if you were to go around saying, “well it depends,” it might be you. So then they go outside themselves to look for advice, whether it's through belief systems, people, mentors, etc. And so they are wanting to hear other people's advice. Now they may or may not go along with it, but they feel a sense of security by hearing other people's viewpoints. Their core longing is they would love for someone to be able to not only say, but prove that you are safe. The type 7 is the “entertaining optimist” and they fear being deprived, trapped in emotional pain, limited, bored, and missing out on something fun. So, the true FOMO’s of the world. They desire to be happy, fully satisfied and content. But you're going to find their core weakness is in glutton. And this isn't just about food. This is a gluttony of life. They have an insatiable desire to fill themselves up with fun experiences and stimulation. The problem is they're like a kid who is starving for several days and they're looking for substance and they go and they find these fun, cool things and they take a big bite out of it and it's just cotton candy. It tastes really yummy and it looks really fun, but it's not satisfying. What they really long to hear is you will be taken care of. This deep, empty space will be completely taken care of. Last but not least, the type 9 is the “peaceful mediator.” They fear being in conflict, loveless, shut out, being in a discordant relationship, overlooked or in any inharmonious relationship. They also really fear just not having a sense of our presence being important. Just being overlooked is a really big thing. Now their desire is to have inner stability and peace of mind. That's what they are constantly striving for. Their core weakness is sloth. Now this isn't a physical laziness because there's a lot of 9’s that are actually super busy, but this is an inner slothness. A not knowing of one’s self. Not knowing their likes, desires, talents, needs - you name it - because they have forgotten them because it's easier to go along to get along, to keep the peace. Why would I want to assert my voice or my desires or what I want if there's going to be any kind of tension or conflict? 9’s would rather just go along to get along so they forget themselves, which means they live in a fog. So if you were to ask me right now like, “Hey Beth, let's go out to lunch later.” I'd be like, “Yeah, cool.” And then you'd say, “Where do you wanna go?” And I'd be like, “Uh, I don't know. Where do you want to go?” That’s the instant thing that a 9 wants to say because we would rather at least hear where you want to go versus say where we want to go. But if you were to say, “Okay, well here's three options,” then I feel okay picking one of them because there's no conflict because you've already given me options. But if you were to make me have an option, I'm going to constantly think, “well, what if she really wanted something else? Or what if she hates pizza?” So that makes a 9 feel very uncomfortable. ALLIE: I'm just laughing because one of my closest friends must be a 9 because all the things that you're saying are just...It's so funny and I get so annoyed. I'll tell Brian, “Why can't she just pick something?” It's just so funny. BETH: Yeah. And we're so afraid that if you didn't like that, then there might be some sort of separation in that relationship, which of course it’s not, but that's how it really feels. So the core longing, last thing is, 9’s desire to be told “your presence matters.” And that is the 9 types. ALLIE: Thank you so much! Everything that you hit on is like, okay, clear as bell. Got it. So I feel the strongest towards type 8 (I haven't done the “wings”) but I also feel strongly pulled towards type 5 and the things that come with that. No matter what type you are, what do you do with this? BETH: Actually, just what you said is exactly why I'm here and why I do what I do. When people look at the symbol, when they see a type 8, they're going to see lines to both 2 and 5. So when you're under stress, you're going to actually take on some of the unhealthy attributes of type 5, where you're going to pull back, become more isolated, withdrawn, shut down a little bit. And sometimes for the 8 it's more about gathering knowledge and information to be back on the offense because they're feeling like they're on the defense, like they might be harmed and controlled. So, they'll pull back into that 5 space, gather information to make sure that they won't be harmed and controlled. But also the 8 are pushing, pushing, pushing so hard that sometimes your body is like, “I keep telling you to take a break and you won't.” So then you become sick or something happens and you're laid out in bed because you didn't take that time. And so, you know, you can push all you want, but when the body says, “uh uh” it's going to force you into that space. So what I try to tell 8’s is instead of being like, let's say a light that's on a dimmer switch being at full blast, you know, where it's really bright all the time? I'm like, just dial it down just a little bit to about 85%. That's still a lot. Whereas the 9, that’s me, I'm like at 30% and it's like, Beth, you know, you might want to rev that up to 45%, you know? So the 9 is the opposite. But for the 8, I'm like, hey, just dial it back a little bit. Conserve some of this. Take care of yourself. You're still going to be plowing forward and doing amazing things, but not at the expense of who you are. It will also catch up into relationships where you're pushing people too hard and expecting them to be at the same level you are as an 8. But then the other thing about what you were just saying is when you're doing really well, you're going to take on some of the attributes of a healthy 2 (that's where the other line for the 8 goes) and you are going to be plowing a path for others. Because the 2’s are wanting to help people and this 8 has this huge machine to plow a path, and having people behind you follow you in that direction. So a great example of that is Martin Luther King Jr. There were a lot of people in the civil rights movement, but he was the one to take on the opposition and plow the path for people. And that is a beautiful example of a healthy type 8. ALLIE: That makes so much sense for me. I don't want this to turn into like Allie’s Enneagram therapy session, but it makes so much sense. It just does because when I feel like I'm at my most emotional, spiritual, mental healthfulness…that's what I do in my business. Like the snowplow analogy, I am helping people and that's my heart. But when I get into the unhealthy end of things, I shut down. My business is affected. I feel like I can't do all the things that I have scheduled, especially if it's something energy depleting like livestreams and I just don't show up. I can't. And it's so hard. That's why I think self-care, reflection, prayer, meditation and those quiet spaces are so important for me because if I don't get those…Those things are already scheduled whether I'm emotionally healthy or not, so I need to prioritize staying emotionally healthy. BETH: Exactly. And here's the thing - growth is hard. And with your personality, when you start to understand why you do what you do and what's harmful or not helpful versus what is, to move in the direction of growth feels like the opposite of what your personality is. I mean it will literally throw a temper tantrum. But if you know why it's doing what it's doing, you can be the adult and the parent to parent your personality back in line like, hey, I know that you think we have to push really hard. As an 8, that feels true. But we've seen time and time again that that actually can harm me if I push that hard. So this is what we're gonna do. We're gonna push at 85% versus 100% so that we can go longer and benefit people more and ourselves. That's where Enneagram coaching can be really powerful. I take people through a process called “Exploring You” where we break down a personality into five sessions so that they can learn, stretch and grow without being overwhelmed. We would do stuff like what we're talking about today – “When was the last time you burnt out and what does that look like?” Then you would tell me and I'm like, “Okay, so what would it look like to do that in a healthy way so that you can prevent yourself from going in that direction again?” When you get there - it's not going to be easy - but at least you now have the tools, the resources and the understanding of why it's happening. Does that make sense? That is one thing that drew me to the Enneagram is because it helped me feel like, “oh my gosh, I understand this about myself.” I'm doing things publicly all the time and so I'll get a lot of not really flak, but just questions like, “Wow, you do a lot of self-care. How do you prioritize it that much? Why do you…? How do you…? What does your husband do that you have so much of this time? I immediately go into the defensive, “Well I need it. Why do I have to explain it?” I feel controlled and judged. I freak out. But it helped me see this is why I've been so drawn to self-care and white space in my schedule, and I will not let this day of the week be full of anything because I have to have that. And I think what's so beautiful about all of this is that we all have things like that. It's just different and if we can just respect everybody's differences and give each other that space, I mean it's just so helpful. It's so empowering. But now that I know 8’s and you're going to get to know 9’s better, it's like us taking each other's glasses and putting them on for, even if it's a brief second, to go, Oh, okay, so 8’s are blunt and straightforward because they respect honesty and authenticity because they fear being betrayed or blindsided. And if someone isn’t honest and straight up forward than I might be blindsided here because I don't know if they're truthful or not. So then it's like, oh, well that's why 8’s are so direct. Now, can they learn how to be tactful in their directness? Sure. But if you understand why it's happening, you don't have to freak out as much. Also for the 9, if you realize how incredibly fearful it is to lose connection of any kind and the feeling that that has as a 9, you will understand why they're so soft and gentle in their approach to people because they don't want any kind of harm to be done because it feels like utter death to them. And so then it's like, oh, well, hey, guess what? Now that I know that you're an 8, I'm like, sweet. I can be more direct and honest as a 9. I don't have to be so soft and sweet and so we can have this more blunt, direct conversation. It just helps us to understand and navigate those relationships more. Also, how I can speak into your life with clarity and love that is in your mother tongue, in your dialect versus mine. And that is really powerful. That's what will change marriages because the stuff that I want to hear is not what my type 6 husband wants to hear. I know your husband's a type 2 and the things that you want aren’t the things that he wants. That doesn't mean we have to be unauthentic to ourselves, it means how can we be our authentic self in a healthy way, but navigating in relationship and the way that they need to hear it. ALLIE: Right. We’re out of time, but we're going to do another Part 2, circling around that with Brian on marriage, parenting and doing life together because it is hard when you're different. I just think, again, it's so empowering to understand all of this about ourselves and our loved ones. So thank you so much! You broke it down so clearly. This was great. BETH: Great. Well I can't wait for the next one. People are gonna love that one. We'll link to you Beth and her site and all the things that she mentioned. You guys can go and get her free downloads and all that good stuff. Thank you so much for your time, Beth!